Protect your smartphone with the Falcon Case with Belt Clip Holster for iPhone XR from Encased. Constructed from polycarbonate and TPU (Thermoplastic Polyurethane), this rugged case gives your phone dual-layer protection from impacts and scratches. 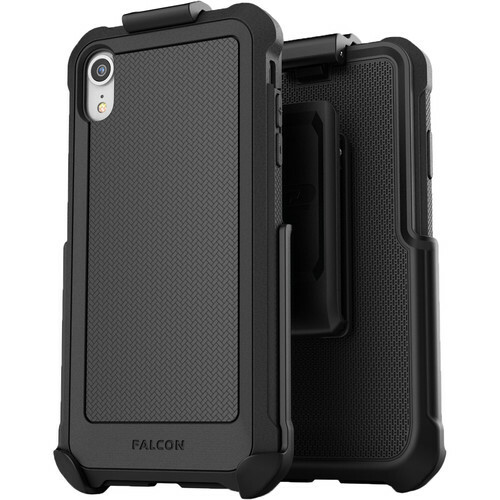 Tested by Encased, the Falcon case is engineered to be impact-resistant from up to 10'. It offers protection on all sides of the phone, even the front, thanks to a raised lip guard that extends past the screen. A belt clip holster is included and specifically designed to work with the Falcon case. Your phone slides in with the protected back of the case facing away from you, while the inward-facing screen enjoys a microfiber lining for added protection. The exterior of the holster features a rubberized grip and a built-in belt clip that's constructed from polycarbonate. A spring-top quick release mechanism helps to keep the phone secure while in the holster but easily removable. Box Dimensions (LxWxH) 6.9 x 4.1 x 0.2"